Let us become the first generation that decides to be the last that sees empty classrooms, lost childhoods, and wasted potentials. Let this be the last time that a girl is forced into early child marriage. Let this end with us. Let's begin this ending... together... today... right here, right now. Let's begin this ending now." were married before their 18th birthday. a lack of freedom to interact with peers and a lack of livelihood opportunities. Child marriage affects boys as well as girls. 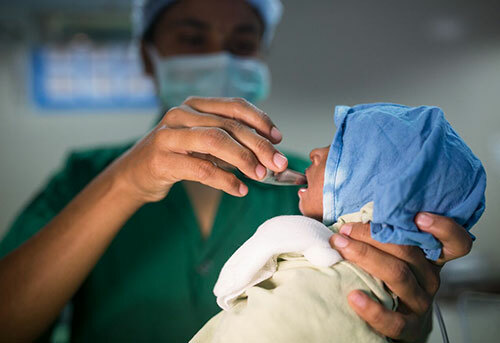 Sustainable Development Goal (SDG) 5.3: Eliminate all harmful practices such as child, early and forced marriage and female genital mutilation by 2030. UNICEF Strategic Plan (2018-2021): 17 per cent of women aged 20-24 married or in a union by the age of 18 (milestone for 2021, a reduction of 8 percentage points) and 3 per cent of men aged 20-24 married or in union by the age of 18 (milestone for 2021, a reduction of 3 percentage points). UNICEF recognizes that child marriage in South Asia is a complex issue, underpinned by a range of socio-cultural and structural factors. Our approach to ending child marriage has two timeframes. Over the next 5-10 years, we see a critical mass of children, families and communities changing their attitudes and behaviour; in the longer term (up to 30 years), we see new structures, institutions and social norms upholding aspirations for all girls and boys. UNICEF has five approaches to bring about these changes: (i) increasing agency and resources for adolescents - especially girls - at risk of and affected by child marriage; (ii) enhancing legal and development policy frameworks to protect the rights of adolescent girls and boys; (iii) using robust evidence for advocacy, programming, learning and tracking progress; (iv) enhancing systems and services that respond to the needs of adolescents at risk of or affected by child marriage; and (v) increasing the investment in girls, and shifting social expectations of girls and boys (including by engaging women and men). Child marriage has been declining in South Asia since 1995 (see Figure below). In 2015, 30 per cent of South Asian women aged 20-24 (about 23 million women) reported having married before the age of 18. If the current rate of decline continues, this will have fallen to 20 per cent by 2030. If progress is accelerated, by increasing attention to this harmful practice and improving opportunities for girls, boys and their families, the rate is expected to be 13 per cent in 2030 and just 4 per cent in 2050. The population in South Asia is not expected to grow, so the absolute number of child brides should decrease if recent trends continue. 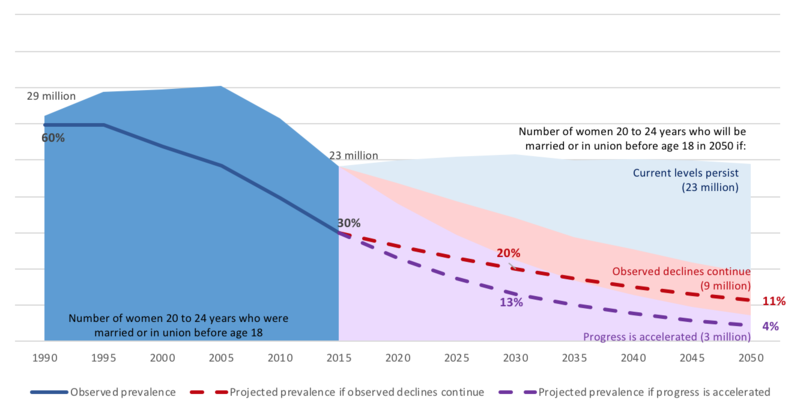 The area chart shows that if the observed decline continues, there will be around 9 million women aged 20-24 who would have married as a child in 2050. Equity – are we reaching the right people? 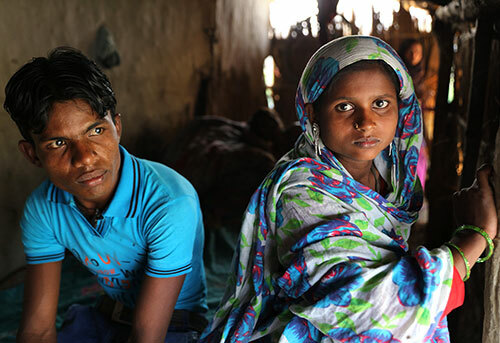 Child marriage is declining in South Asia. In 2015, at the beginning of the last Strategic Plan, it was estimated that 45 per cent of women aged 20-24 had married before the age of 18: that figure has now fallen to 30 per cent. It was also estimated that, by 2030, 35 per cent of young women aged 20-24 would have married as a child but, because of the accelerated reduction, the estimate is now 20 per cent. But we still need to focus on ending this harmful practice because structures of gender and patriarchy and age-based discrimination continue to fortify child marriage. 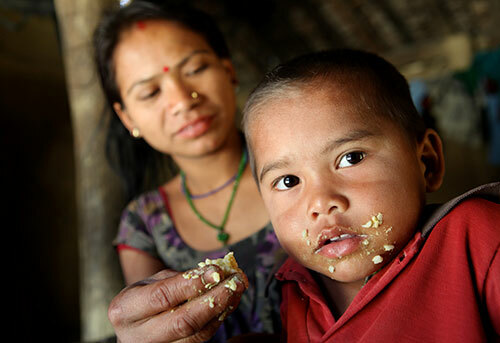 The child population in the region is large, demanding similarly large-scale interventions. As well as engaging with governments, we require population-wide approaches to reach millions of people. The South Asia Initiative to End Violence against Children (SAIEVAC) adopted a Regional Action Plan to End Child Marriage in August 2014. This plan sees reforming legislation, improving access to services, empowering children, advocacy and monitoring to be important steps towards ending child marriage. It provides guidance to countries and sub-national entities developing their own plans to end child marriage. The action plan is currently under review, with the intention of updating it for the next five-year period. The government launched a multi-sectoral National Strategy to End Child Marriage in 2016; a national implementation plan is under development. On 23 March 2016, Nepal hosted its first Girl Summit as part of its commitment to end child marriage by 2030 made at the 2014 London Girl Summit. Girl Summit II - a series of advocacy events at municipal, state and national levels - began in March 2018 and will continue until October 2018. In 2017 two important pieces of legislation were adopted, the National Civil Code Act and the National Penal Code Act, both effective from August 2018. These recognize that the legal age of marriage is 20 years for both girls and boys. In 2017, the government adopted a 2017-2021 National Action Plan to Eliminate Early and Child Marriage. Led by the Deputy Ministry for Youth Affairs and the Ministry of Women's Affairs, the plan was also supported by UNFPA, sectorial ministries, United Nations agencies including UNICEF, and international and civil society organizations. 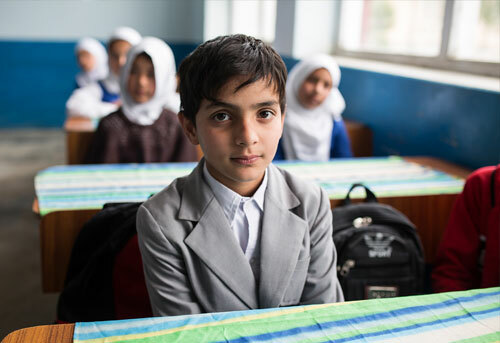 The plan, launched in April 2017, seeks to address the complex nature of early and child marriage in Afghanistan. It encourages stakeholders to consider the root causes and to improve access to and delivery of effective, efficient services. The state of Bihar has a high prevalence of harmful practices such as child marriage and dowry payment. To spread awareness of these damaging social conventions, Nitish Kumar, the Chief Minister, led a human chain some 14,000 km long, composed of hundreds of thousands of people, across Bihar in January 2018. Last year around 40 million people joined a human chain on the same issue and in 2018 the number of people who joined the human chain was even higher. The government has launched a National Action Plan to End Child Marriage and has been supporting 5,000 community-based adolescent clubs. These clubs, run by the Ministry of Women and Children, discuss and address harmful social practices like child marriage. The government also operates two helplines (1098 and 109) to combat violence against women and children; it also provides outreach services to women and children to stop child marriage. 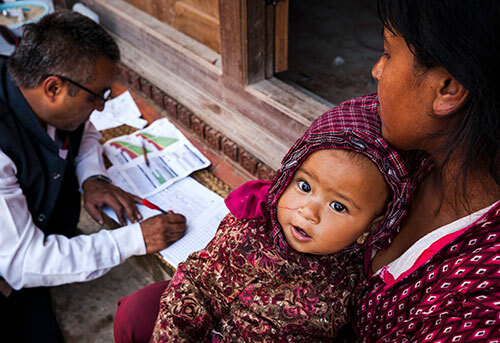 UNICEF supports the government to deliver on its commitments under the Asia Pacific Regional Action Framework to ensure universal civil registration and vital statistics by 2024. This includes a more specific commitment to universal birth registration as a sustainable intervention to combat child marriage. UNICEF and the mobile phone operator Telenor have joined forces to use mobile technology to make it easier to register births - more or less in real time - in Sindh and Punjab provinces. A new global development agenda - Transforming our World: the 2030 Agenda for Sustainable Development - acknowledges that sustainable and positive outcomes in development will not be achieved unless violence against children ends. All children must be able to live free from fear and violence, which means that all harmful practices, including child marriage, need to cease. Child marriage is included within Goal 5 'Achieve gender equality and empower all women and girls'. Target 5.3 is 'Eliminate all harmful practices, such as child, early and forced marriage and female genital mutilation', which will be measured partly in terms of the percentage of women aged 20-24 who were married or in a union before the age of 18. Amin, Sajeda, et al., Delaying child marriage through community-based skills-development programs for girls: Results from a randomized controlled study in rural Bangladesh, Population Council, New York and Dhaka, Bangladesh, 2016. Department of Population Sciences University of Dhaka, Context of Child marriage and Its Implications in Bangladesh, UNFPA, 2017. ECPAT International, Unrecognised Sexual Abuse and Exploitation of Children in Child, Early and Forced Marriage, 2015. J-Pal and UNICEF, Supporting Adolescent Transition to Adulthood: What Works and What Doesn't, 2017. JuRI-Nepal, Centre for Reproductive Rights (CRR) and UNFPA, Ending Impunity for Child Marriage in Nepal: A review of normative and implementation gaps, 2016. Lee-Rife, Susan, et al., What Works to Prevent Child Marriage: A Review of the Evidence, Studies in Family Planning, vol. 43, no. 4, 2012, pp. 287-303. Ministry of Finance, Ministry of Women and Children, A Scoping Analysis of Budget Allocations for Ending Child Marriage in Bangladesh, Government of Bangladesh, 2018. Parsons, Jennifer, and Jennifer McCleary-Sills, Preventing child marriage: lessons from World Bank Group gender impact evaluations, enGender Impact, the World Bank's Gender Impact Evaluation Database, Washington, D.C., 2014. Population Council and United Nations Population Fund, Baseline Survey Results Accelerating Action to End Child Marriage in Bangladesh, 2017. Population Council and United Nations Population Fund, Community Assessments Accelerating Action to end Child Marriage in Bangladesh, UNFPA, 2017. Sekine, Kazutaka and M. E. Hodgkin, Effect of Child Marriage on Girls' School Dropout in Nepal: Analysis of Data from the Multiple Indicator Cluster Survey 2014, PLoS ONE, vol. 12, no. 7, e0180176, 2017. Singh, Renu, and Uma Vennam, Factors Shaping Trajectories to Child and Early Marriage: Evidence from Young Lives in India, 2016. UNICEF and UNFPA, Mapping of Child Marriage Initiatives in South Asia, 2016. 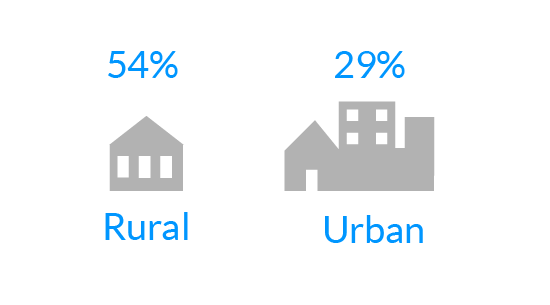 UNICEF, District-level study on child marriage in India: What do we know about the prevalence, trends and patterns?, 2015. 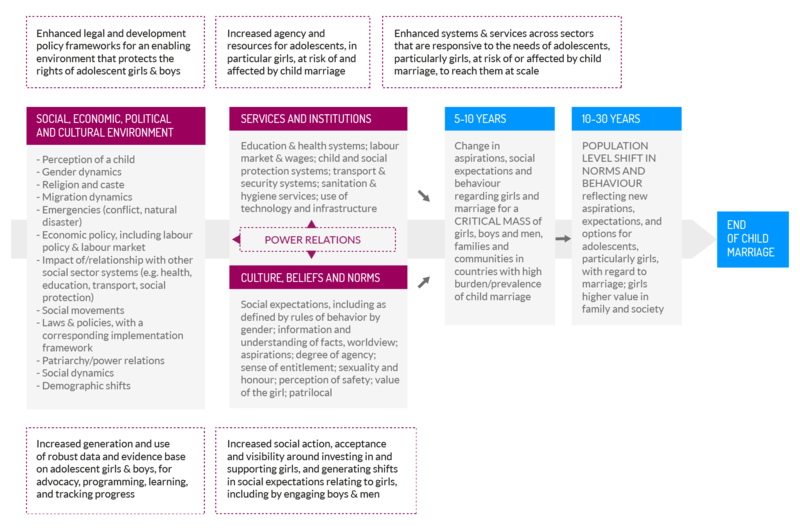 UNICEF, Reducing Child Marriage in India: A model to scale up results, 2015. United Nations Children's Fund and United Nations Population Fund, Key Drivers of the Changing Prevalence of Child Marriage in Three Countries in South Asia: Working Paper, UNICEF, Kathmandu, 2018. 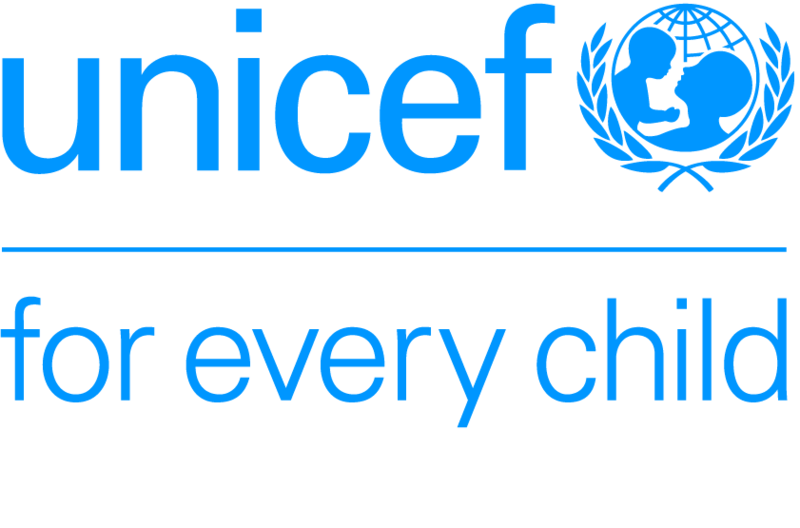 United Nations Children's Fund and United Nations Population Fund, Key Drivers of the Changing Prevalence of Child Marriage in Bangladesh, Nepal and Pakistan: Working Paper, UNICEF, Kathmandu, 2018. United Nations Population Fund, Evaluation of UNFPA Support to the Prevention, Response to and Elimination of Gender-Based Violence, and Harmful Practices 2012-2017, 2017. Wodon, Quentin T. et al., Economic impacts of child marriage: global synthesis report. Economic Impacts of Child Marriage, World Bank Group, Washington, D.C., 2017. In a small town in of Jaipur in Rajasthan, local government - together with villagers and the police - declared the area to be a child-marriage-free zone. A publicity campaign, Ladli Saman (Value Your Daughters), is run with support from UNICEF. Villagers now monitor child marriage in their areas and lead discussions with other community members on the damaging effects of child marriage. A man from the Tonk area said, "There are a lot of child marriages in our community due to poverty and very poor literacy. I feel a sense of responsibility to work with the villagers to end child marriage from our community because I personally got married when I was five years old. My wife came to stay with me when I was fifteen and she was twelve. I have the experience to know that child marriage is not a good thing. For boys, it is a lot of responsibility. 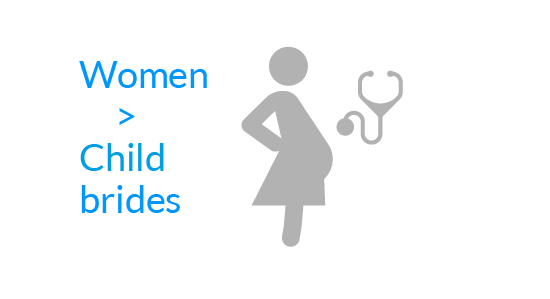 For girls, there can be so many health problems." This campaign, with UNICEF's support, has been running for three years - in 12 of the 50 gram panchayats (villages), no child marriages have been reported.